On Tuesday, two-time SEC Player of the Year and consensus First-Team All-American Grant Williams announced he will test the NBA waters by going through the NBA Draft process. Williams said he will hire an agent and get feedback from the league, but he’s leaving the door open to return for his final year as a Vol. 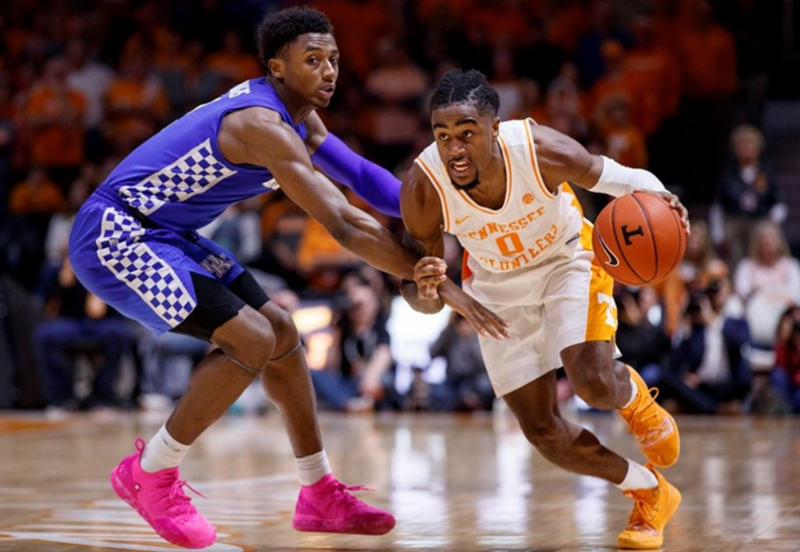 His teammate, Second-Team All-SEC point guard Jordan Bone, announced last week that he is declaring for the 2019 NBA Draft and will likely stay in the draft but will also leave the door open for a return like Williams. During his press conference on Tuesday, Williams was asked if Bone’s ultimate decision would affect what his final choice would be. If Bone decides to come back for his senior season, would Williams follow? “My whole thing is going to be going into the process for the best decision for myself,” Williams replied. “Sure, if Bone stays, that’s huge because it adds a little bit to it. I always wanted to go into it with the most informed decision-making that I can. 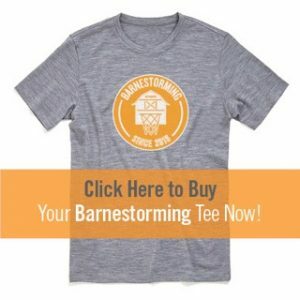 Click the image above and use the coupon code MM15 to get 15% off your Barnestorming tee while supplies last! Both Williams and Bone have until May 29th to withdraw their names from the NBA draft pool to retain their collegiate eligibility. NBA rules call for a later withdrawal deadline on June 10th, but the NCAA has its own set of rules that say the deadline is 10 days after the NBA Combine. This past season saw both Williams and Bone grab the attention of national analysts and the college basketball world in general. Williams had one of the more decorated seasons in UT men’s basketball history, and Bone was no slouch himself, setting the school record for best assist-to-turnover ratio in a season (2.91) and finishing with the third-most assists in a season in school history (215). Throughout the season, both players received a ton of praise for their play on the court, and both were talked about as future NBA players. According to Williams, though, that talk didn’t distract him during the year. “For myself during the year, I didn’t really pay much attention to it,” Williams said. “I just played the game because I know if you put your heart and mind into basketball, it’s going to take care of itself. Jordan Bone and I are roommates, so we had conversations about it every now and then. We trust each other. For Williams, there isn’t much else left to achieve from an individual perspective in college unless he wants to set some records. He’s already won the SEC Player of the year in back-to-back years, and he was named a unanimous consensus First-Team All-American this season. He could break some career school records next season and could become one of the few SEC players to win three-straight conference Player of the Year awards. He could even compete for a National Player of the Year award again. But aside from that, there’s not much left for Williams to accomplish by himself. As a team, though, there’s plenty left to try and achieve. In Williams’ first season, the Vols didn’t accomplish a great deal on the court. Tennessee went 16-16 in his first year on campus and finished in the bottom half of the SEC. In his second year as a Vol, Tennessee shocked the college basketball world by winning a share of the SEC regular season title and earning a No. 3 seed in the NCAA Tournament. That season, though, ended in disappointment, as the Vols were bounced in the second round of the tournament by Cinderella team Loyola-Chicago. This past season, Tennessee soared to No. 1 in the AP Poll for four-straight weeks, and the Vols won a program record 19-straight games. Tennessee earned a No. 2 seed in the NCAA Tournament, but again, their season ended in disappointment. The Vols lost in overtime to Purdue in the Sweet Sixteen, coming up a round short of only their second-ever Elite Eight appearance. That type of unfinished business could lure Williams back for next season, especially with all the talent that will still be on the roster. “We have a lot of talented players coming in,” Williams stated. “We have Josiah-Jordan James, Drew Pember, Davonte Gaines, and guys that are already here. Guys that are ready to step up. Guys that are going to adapt. There’s opportunity for Bone to come back as well. He could come back, and it could be another great year. It could have a huge impact on this university.